Visited: We visited St. Lucia twice: April 26 - May 7, 2002 with Emilie Cobb, and again as we sailed south from July 1-5, 2002. History: The Europeans first came to Saint Lucia in 1500, but the first successful settlement was not made until 1635, by the French, who later signed a treaty with the indigenous Caribs in 1660. 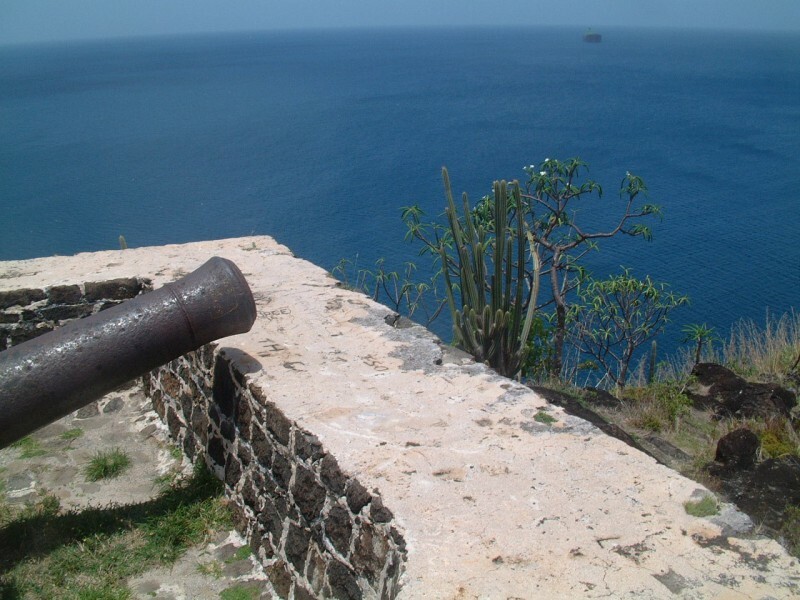 From 1663-1667 the English held control of the island and until 1814, when the British finally took solid control, St. Lucia bounced between the French and English. In 1924 a representative government was introduced. 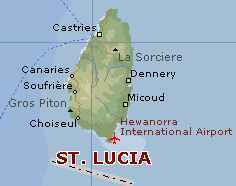 From 1958-1962, St. Lucia was a member of the Federation of the West Indies. Five years after that, they became a state of the West Indies Associated States, and formed their own internal government. 1979 turned out to be a bigger achievement, however, when they became a fully independent state within the Commonwealth of Nations. Recent History: In 1992 Derek Walcott, a native of Castries, won the Nobel Prize for literature. In 1997, the Labor Party won 16 out of 17 seats in parliament, defeating the United Workers' Party which had controlled the government since 1982. Kenny Anthony, the labor leader, became the new prime minister. (Amanda, age 13) I can't believe it. St. Lucia seems so far north and so long ago now that we've been down to Grenada. Let's see, what did we do there? 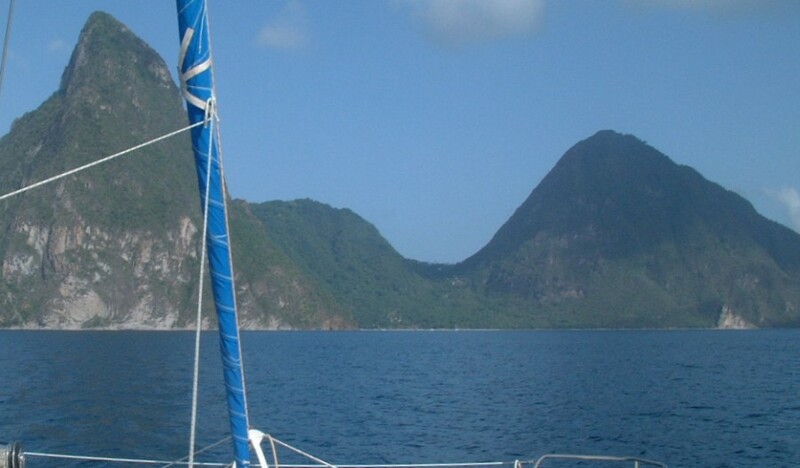 We anchored in Rodney Bay's outer bay, where you can, at least sometimes, see the bottom, unlike in the lagoon. The worst thing about the bay was probably the loud music at night, though there wasn't much. One night, however, there was a big hotel party on the beach. We went ashore to take a look, and found out it was private (piffle). We hung around anyway, listening to the steel-drum band. When we wandered down the shore a little, we found less-satisfactory music, where a different hotel was having a karaoke night. Most of the time, karaoke is okay, unless you get someone who thinks their voice is great but it really isn't, and they do a lot of the singing. *shudder*. We went back and listened to the steel band. I'm a party person, one for loud music, so I enjoyed the trip into town that we made. We were sitting in the back seat, and the speaker was right behind us. I loved it . In town, there are many little stands of locals selling stuff: souvenirs, herbs, spices, that sort of thing. We walked around a little on the streets, being very careful of the deep, open gutters, until it began to rain. In my opinion, that is the worst part of the tropics, when it rains, is sunny, and there's no wind. It gets very hot and humid. So we stopped in the shade for a roti (my first) and drink for lunch. Yum. By the way, a roti is a wrap (flour tortilla) with curried potatoes and either chicken (with or without bones), beef, fish, or lambi (conch). It's the local West Indian quick lunch. The fort up on Pigeon Island was fairly interesting, but very hot. The long walk to get up to it wasn't all that fun, either. But up at the top, there was a great view, and interesting five-inch moths flew out of the ammo-storage area every once in a while. Down the coast was not really as interesting on shore, but the underwater life was much cooler. 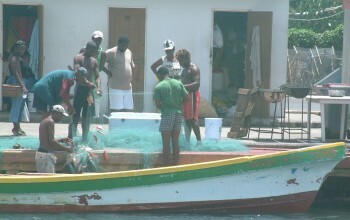 Many reefs on St. Lucia are protected, so we got to see the unaffected life. Very cool. Rodney Bay Marina - This was cow pastures in the 80s! (Jon) St. Lucia was our primary base when Sue and I cruised here in the 1980s, but the northern part is now almost unrecognizable to us. Stevens Yachts is gone along with its dock, but some of the people we knew (like Ins and Ian Cowan) are still around. Rodney Lagoon is just as yucky as it always was, but instead of cow pastures it's now surrounded by fancy houses, a huge marina, hotels, boatyard, restaurants, etc. There's even a nice high-speed cyber-cafe. But some things haven't changed. The busses still go careening down the (wrong side of the) road at full tilt with the reggae blaring out. The market ladies still sell their wares from little stalls in the funky old downtown market. The old Rain Restaurant is gone, but you can still find a good roti and a beer when a rain shower forces you off the streets. Rodney Bay itself hasn't changed too much despite the increased number of boats. It still has a series of nice hotels on the right (south) side which ends with the cut to the lagoon and the town of Gros Islet (which is just as funky as ever but now has an interesting street jump-up every Friday). The long spit out to Pigeon Island now has a huge, garishly blue roofed resort on it, and the locals still like to swarm to the beaches on weekend afternoons. One of the big changes has been the declaration of lots more marine parks down the SW side of St. Lucia. Lots of relatively inexpensive moorings have been put in to minimize damage to the reefs, and we were thus able to easily explore reefs and coves that we hadn't been to before. Good fun! (Sue) Strangely, after 20 years absence from St. Lucia, I found the people more friendly than I had remembered. It was also interesting to think that a whole generation had grown up in the mean time! The country has certainly prospered economically more than some of the other Windward Islands. Tourism is alive and well here, with newer busses (many drivers have stopped naming their buses, so that local color is gone), new resorts, and fancier shops around the outskirts of Castries. The best part of the island was definitely the snorkeling on the west coast, and the unforgettable view of the Pitons rising straight out of the ocean. (Chris, age 15) St. Lucia's interior didn't hold a lot of attraction for me, although it would have been nicer if the locals hadn't been such a nuisance sometimes (it was like we had a big sign, 'Come hassle me, and maybe I'll give you money for it.') There was a nice botanical garden, and it was neat to see the Pitons, but the thing I liked most about St. Lucia was the snorkeling. St. Lucia has protected all of its notable reefs, and it is illegal to damage the coral. This means that it has some fairly nice reefs, and I enjoyed exploring them.